Walk into any Home Depot store in the world and you’ll be confronted with a cavernous, sprawling inventory of virtually anything you’d need to make your property more comfortable. Founded in 1978 to satisfy the increasing numbers of hammer-wielding do-it-yourselfers, the company is currently the fourth-largest retailer in the country—an impressive feat considering it doesn’t sell food, electronics, or clothing. (Unless you count their stylish, figure-flattering lead paint abatement suits.) Have a look at some structurally-sound facts about the franchise, apron flair, and how the circus lent them their distinctive orange glow. 1. THE FIRST STORES WERE FILLED WITH EMPTY BOXES. When Bernie Marcus (left) and Arthur Blank (right) were abruptly fired from their managerial spots at the Atlanta-area Handy Dan hardware chain, they decided to experiment with discount, bulk-volume pricing under their own banner: the Home Depot. While the first few stores to open in Georgia were up to 60,000 square feet, the two didn’t necessarily have enough stock on hand to fill them up. Instead of looking at empty rafters, employees stacked empty boxes and paint cans on the upper-tier of shelves, where no customer could reach them. To drive home the warehouse aesthetic, Marcus and Blank also sped around stores on forklifts after hours, slamming on the brakes to create skid marks. 2. THE ORANGE COLOR SCHEME CAME FROM CIRCUS TENTS. 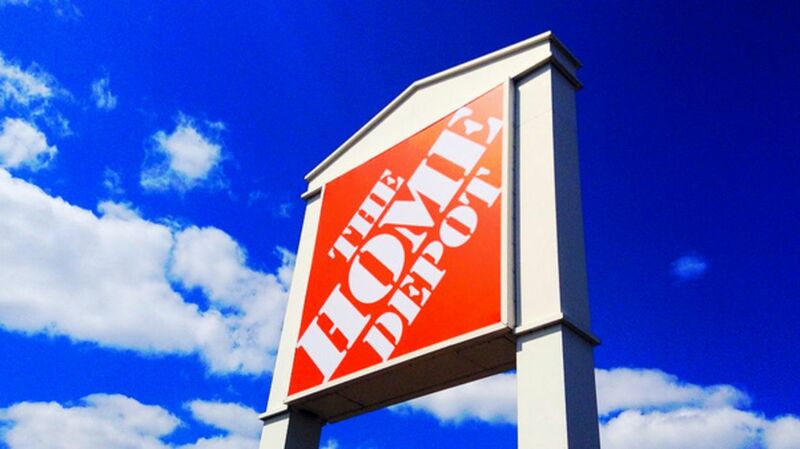 Home Depot’s signage is so synonymous with orange that the color is the first thing people say when asked to play word association with the company. But there was no calculating psychology behind the selection: The company gravitated toward the color because early signage was made from discarded circus tents. They even trademarked orange when it's specifically presented as a backdrop in advertising home goods. 3. THEY COULDN’T PAY PEOPLE TO COME INTO THE STORE. As marketing strategies went, it was fairly pedestrian: Marcus and Blank stationed their kids at the exit door of their first store during its grand opening in 1979 and had them gift shoppers with a dollar as a way of saying thanks. But by 6 p.m., so few customers had stopped in that the kids were now out in the parking lot offering free money to anyone who would step inside. After consumers became familiar with their selection and instructional clinics, Home Depot grew successful enough to put Handy Dan out of business. 4. THEY EMPLOYED OLYMPIC ATHLETES TO BOOST MORALE. Up until they canceled the program in 2009, Home Depot employed Olympic athletes from the U.S., Canada, and Puerto Rico in an effort to support amateur athletics and boost employee morale. Olympic hopefuls got part-time hours with full-time pay and benefits so they could continue training; if they won medals, they were encouraged to show them off to other employees in an effort to motivate them to go for their own (store-oriented) goals with more enthusiasm. The athletes were even able to draw a salary when they were on the road for qualifying competitions. For the 2000 Games, more than 100 entrants were Depot employees. 5. WORKERS CAN CUSTOMIZE THEIR APRON. Not all of the store's omnipresent vests are orange. Some workers, including military veterans, have customized their apparel to better reflect their personalities. The company also encourages employees to write their names in longhand—they ditched white name tags decades ago. Film productions shooting in Fayetteville, Ga.'s Pinewood Studios have perks beyond personal assistants: The property is also home to the country’s only private Home Depot. Open to cast and crew members only, the store primarily stocks lumber, screws, and other common set supplies. (The company was attracted to the idea that films spend about 30 percent of their multi-million dollar budgets on construction.) So far, so good: Marvel Studios set up shop there for 2015’s Ant-Man and is currently on location for 2016’s Captain America: Civil War. 7. THEY GOT IN BIG TROUBLE FOR ALLEGEDLY NOT PROMOTING WOMEN. The chain was among the stores swept up in a wave of gender-discrimination lawsuits in the 1990s alleging unfair promotion practices. According to the New York Times, Home Depot paid an $87.5 million settlement to workers on the West Coast who argued the store kept women at checkout stations and off of the floor, thus removing any potential for advancement. While the company didn't acknowledge any wrongdoing, it also agreed to reform internal policies on promoting women in their workforce. 8. THEY MIGHT LET YOU HAGGLE ON THAT CHAINSAW. While "haggling” sounds like something JK Rowling dreamed up, in the pre-Internet world of retailing it was the term used for trying to talk a shopkeeper down on a price. Elevated to a kind of conversational art form—sighing, weight-shifting, and condescending chuckling optional—it’s largely disappeared. But because e-tail prices frequently undercut physical stores, Home Depot is among the chains that may discount their price by as much as 10 percent after matching a competitor. It doesn’t hurt to ask. 9. THEY TRIED OPENING CONVENIENCE STORES. Seeing dollar signs in trucker pills and expired milk, the company entered the convenience store market in 2005 by setting up gas stations next to four of their Nashville, Tenn. locations. Despite ambitious plans to open 300 such footprints over the next several years, they only managed to launch six before deciding to focus on other growth areas. 10. THE APRON CAN BE DANGEROUS. Every Home Depot ground troop is issued a customary orange apron for easy identification and to keep concrete dust from ruining a perfectly good Van Halen shirt. But despite the utilitarian nature of the uniform, the aprons aren’t always appropriate. In 2003, the Occupational Safety and Health Administration (OSHA) fined a Denver-area location $5000 for incidents relating to dress-related injuries. In two instances, associates lifting heavy items got them inadvertently caught on the smock, leading to a loss of balance and shoulder injury, respectively. Employees who spoke to OSHA complained of its “kangaroo” pockets, which are loose enough to catch corners of major appliances. The company subsequently allowed workers to take the aprons off when loading rental equipment. 11. WANNA KNOW WHAT THEY CARRY IN THOSE POCKETS? Probably lots of loose nails, cell phones, and assorted grit. But when former military man Robert Nardelli took over as CEO in 2003, he required that employees keep something else in their pouches: a copy of How to Be Orange Every Day, a 25-page booklet with breezy tips on how to better service visitors. “Every person, penny, and product counts” was a typical recitation. Nardelli resigned in 2007. In his pockets: a severance package worth $210 million. 12. THE COMPANY HAS ITS OWN FONT. The store’s distinctive brushed typeface used for pricing on shelves is exclusive to the store. Named HOMER in honor of their mascot, Homer D. Poe, it may not be quite as functional as Times New-Roman, but the slightly smudged edges are reminiscent of an afternoon paint job. 13. A CAT LIVED IN ONE FOR OVER 13 YEARS. Putting to shame all of the performance artists who have filmed in IKEAs and people camped out in Walmart lots, an alley cat named Depot can probably claim the record for most time spent living rent-free in a retail location. As of 2014, the feline has been lounging around a South Carolina Home Depot for 13 years, greeting customers and spending much of her time luxuriating in the garden department. After word circulated the store might evict her because she kept setting off security alarms, online protests led a company spokesperson to declare Depot had tenure. Said one customer to local news outlet WTOC: "I'd get rid of management before I'd get rid of the cat."